Jersey, a W. county of Illinois, bounded W. by Illinois river, and separated from Missouri on the S. by the Mississippi; area, 352 sq. m.; pop. in 1870, 15,054. The surface is diversified with prairies and woodlands, and the soil is generally fertile. The main line and the Jacksonville division of the Chicago and Alton railroad, and the Rockford, Rock Island, and St. Louis railroad, traverse it. The chief productions in 1870 were 558,367 bushels of wheat, 519,120 of Indian corn, 71,770 of oats, 39,330 of potatoes, 13,226 lbs. of wool, 180,-078 of butter, and 11,650 tons of hay. There were 4,531 horses, 2,978 milch cows, 7,977 other cattle, 4,552 sheep, and 16,056 swine; 2 manufactories of boots and shoes, 3 of car-riages, 2 of boats, 7 of cooperage, and 8 flour mills. Capital, Jerseyville. Jersey, the largest and most important of the Channel islands, lying in the English channel, 15 m. from the coast of France, and belonging to Great Britain. It is about 12 m. long from E. to W., and 7 m. wide, and contains an area of 45 sq. m.; pop. in 1871, 56,-627. The coast is indented with numerous excellent harbors, and save toward the south is in general bold and precipitous. The surface is an alternation of wooded hills and fertile valleys. The highlands in the north consist chiefly of granite, and the reddish white syen-itic granite which-forms the cliffs on the N. coast is quarried extensively for exportation. In the south schist is found overlying the granite formation. The island contains neither limestone, chalk, marl, nor gravel. The climate is mild and healthful. Agriculture has recently been greatly improved. Land is held at a high rent, the holdings averaging but 15 acres. Alderney cows, small sturdy horses, sheep chiefly of the Southdown stock, and a few varieties of feathered game are the most important animal productions. Nearly all forest trees common to this latitude are found to thrive; wheat, potatoes, parsnips, and lu-cern are cultivated, and much attention is devoted to apple orchards, for which the soil and climate are particularly favorable; as many as 30,000 hhds. of cider have been made in good years. One of the most remarkable products of Jersey is its Chaumontelle pears, a single one of which frequently weighs a pound. The most important manufactures are shoes and hosiery. Great numbers of ships are also built, as timber and cordage are duty free. The chief exports are cattle, potatoes, and oysters; the principal imports are woollens, hardware, soap, glass, earthenware, and coal. The oyster trade employs about 3,000 persons and 400 or 500 vessels. The principal beds are on the E. side of the island, the best being nearer to the French coast than to Jersey. Between the months of February and May about 200,000 bushels of oysters are sent from the Jersey beds to England, where most of them are deposited in "parks " along the coast of Essex and the Thames, to be withdrawn according to the demand of the London market. 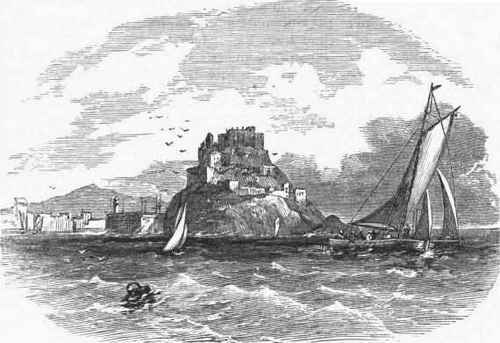 The harbor of Gorey on the E. shore of the island is the principal rendezvous for the vessels. Near it is Mount Orgueil castle, a picturesque structure on a headland between St. Catharine and Grouville bays. It was once the principal fortress on the island, and it was the residence of Charles II. during a part of his exile. - Jersey has a legislature of its own, called the "states," or insular parliament. It consists of the governor and the baily of the royal court, who are appointed by the crown; the 12 judges of the royal court, who are chosen for life by the rate payers; the rectors of the 12 parishes, who are appointed to their livings by the governor; and 12 constables (one from each parish), elected for three years by the inhabitants. The vicomte, or high sheriff, and the two denonciateurs, or under sheriffs, occupy seats as officers of the assembly. The crown officers may take part in the debates, but not vote. The governor in special cases may confirm or annul the decrees of the states. The royal court is the supreme tribunal in civil and criminal cases; appeal lies from it to the sovereign in council. The language of the upper classes is generally French, but the masses still speak a dialect of the old Norman and preserve a number of Norman feudal customs. The capital is St. Helier.